Old-fashion poker theory command a game based on tight and aggressive play. But this have changed after young online poker players have proved that more money could be won by playing another kind of style, the so-called loose-aggressive, or even hyper loose-aggressive. The main benefit of the LAG-style is that you can win pots without having a legitime hand. That means simply that you could potentially win more hands, by a higher frequency. If you play loose before the flop, you must continue to do so after the flop. By raising pre flop, get call by an opponent and when don’t bet again, you are doing your opponent a twofold favor: you increase the pot, and you give it to him (if he got enough sense to bet). Of course, that is an exaggeration, but in principle it is true. You could of course refrain from betting and when instead call your opponent’s bet. That is something you more or less must do if you don’t bet yourself, but it’s often too passive, and if you are that passive post flop you better refrain from raise pre flop in the first place. This don’t mean that you must continue to bet after the flop if your raise pre-flop 100 times out of 100, that would actually be non-optimal since it makes you vulnerable for check-raise bluffs from an opponent that observes the patterns. But, your standard play post flop must be an aggressive one if you are raising pre-flop. If you increase the pot, you must fight for it. The texture on the flop will dictate when you should avoid a continue-bet. 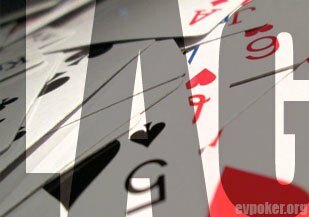 If three low cards are dealt on the flop, your opponent will probably don’t think you hit something and betting would therefore often be called. On the other hand, if you have hit something, just go ahead and bet, you will get pleasant implied odds! How often you should bet also depend on the opponent’s style. If he is a calling station, you should bet into less pots when you miss the board. The same can be said if you meet a very aggressive player that often raise your bets. But the standard play is to continue-bet. This will win many pots since your opponent for the most times doesn’t have anything. Many players will often call to see the flop but are not very interested to fight for the pot without a hand. Just being loose-aggressive wasn’t enough for everybody and so was the hyper loose-aggressive style born. There have obviously always been players that could be characterized as maniacs on the poker tables. That is just an observation of diversion among humans. But what is a complete other thing is: winning hyper loose-aggressive strategy. From the perspective of old-fashion poker theory, it was not plausible to play hyper-loose and hyper-aggressive and win. But in the days of online poker, things have changed. Many proofs have been found, both on low and high stakes levels, that the hyper LAG-style could be extremely effective. Why does it work? Mainly because you have only two cards in games such as Texas Hold’em and in most cases your starting hand will not be very good; neither after the flop will your hand often be very good. Therefore, betting without a hand makes sense. Another reason is that 6-max tables is much more common than 9-tables in the online poker era. Full ring tables with 8-10 players were standard at brick and mortar casinos. It is more lucrative to fill the floor area with such tables and less dealers are needed per player. Playing at a table with eight other players is not the same thing as playing with five others. Are you facing eight players, the risk is much higher that another player has a good hand, so trying to “steal” the pot with mediocre hands will often not work. Therefore, don’t try a hyper loose aggressive approach on these tables. You should do it on 6-max tables or in tournament formats that involves only two, three or four players. The hyper loose-aggressive style doesn’t fit everybody. You must have it in you to bully your opponents and attack lots of pots. And you must be prepared to lose in the short-term. All forms of LAG-style play will increase the variance: you will experience more real good session and real bad ones. Everyone can’t handle that mentally. The other thing is that successful LAG-style play demands a lot from you. When TAG-style is more about the cards (to generalize some), LAG-style is much about playing the player. Yes, you will profit on the condition that most players don’t have a good hand in most cases, but you must also observe the players to find out which are obstinately going to fight for many pots and which will give them away with less resistance.